I've run my Wilwood front brake BBK for 2 years and 25k miles with a handful of track days on 'em. Before that, they were on a car that was tracked very regularly and only God knows the abuse they suffered there (you know who you are, Graham! ). Note: I'm not a professional mechanic, nor do I play one on TV. I'm definitely not a safety expert. Please use your own common sense and consult a professional if needed. I'm still alive and kicking with all of my fingers and toes intact after doing this work and I sincerely hope that you will be too! This was a pretty extensive rebuild this time where I replaced almost all of the hardware possible to replace. A lighter rebuild (and must less expensive) could be done by cleaning / polishing as below and just replacing the Main Seals and cross-over seals, re-using the pistons, bleed valves, etc. I bought this caliper set used and they had a hard life before coming to me, so I thought it was time for a complete refurb. 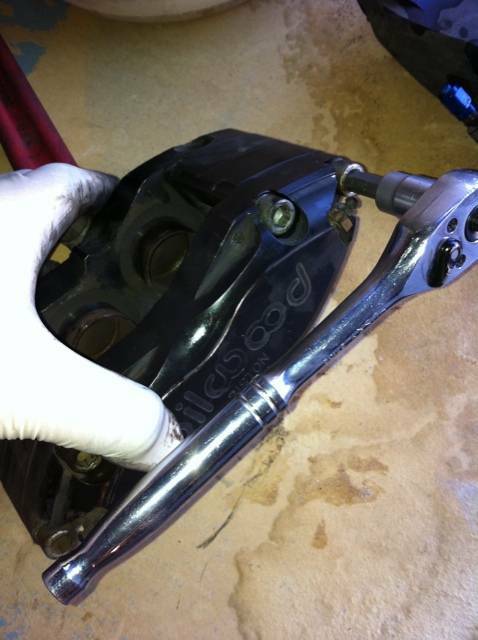 NOTE: Todd from TCE mentioned in the discussion thread that splitting the caliper (which I did, below) is not a good idea as the 4 bolts that hold the calipers together have thread locking compound on them that can dammage the threads in the aluminum caliper when the bolts are removed. I've had these bolts out before, so any dammage was already done on mine, but you may want to not split them and to wiggle the calipers out from the side. This may make polishing more difficult as well, but if I didn't split the calipers, I probably would have scrubbed 'em down and used some 2000 grit sandpaper (wet) if I felt further polishing was necessary. I put the front of the car up on jack stands and pulled the front wheels. 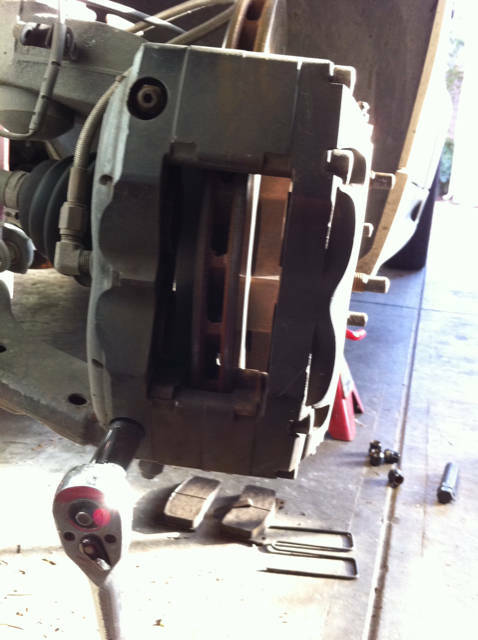 I removed the brake pads and removed the 2 bolts that holds each caliper in place. I the cut some paint stir sticks down to the size of the brake pads and pumped the brake pedal to extend the pistons. 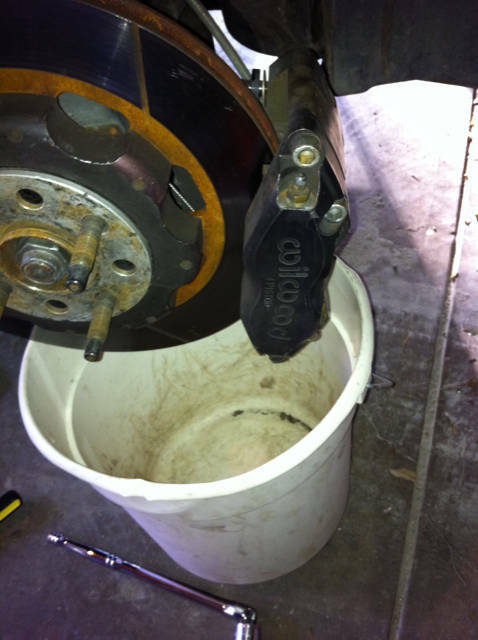 I then shimmied the calipers off of the mount and disconnected the brake fluid line. Todd at TCE sells a cap kit that is well worth the money. No dripping brake fluid! Next I stripped the hardware down... remove the bleed valves and the 4 long bolts that hold the two halves of the caliper together. Once you remove the 4 long bolts, each caliper will split in half. 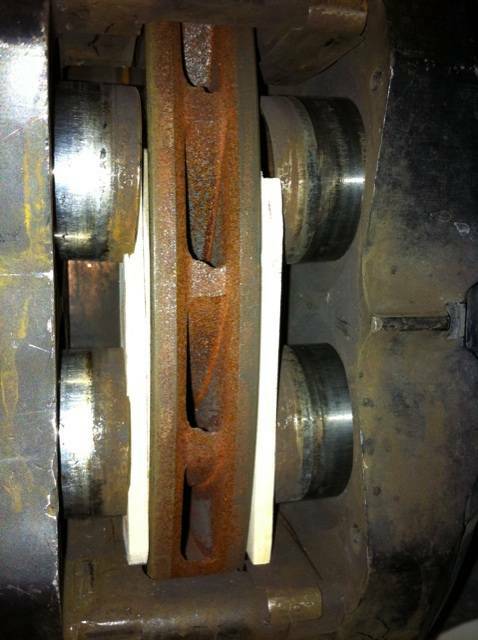 There is a compression gasket (an o-ring) that goes on the cross-over channel that leads from one half to the other. You can see it on the lower half of the pic below. Peel it out and throw it away... you need a new one for each caliper. Now comes some dirty work. It is time to don the eye protection... the fluid is gonna fly. Take a pair of pliers and pull out the pistons. If you are going to reuse them, don't grip them directly with the pliers... pad with a cloth so you don't scratch them. I'm putting in new, stainless pistons, so I just yanked 'em. 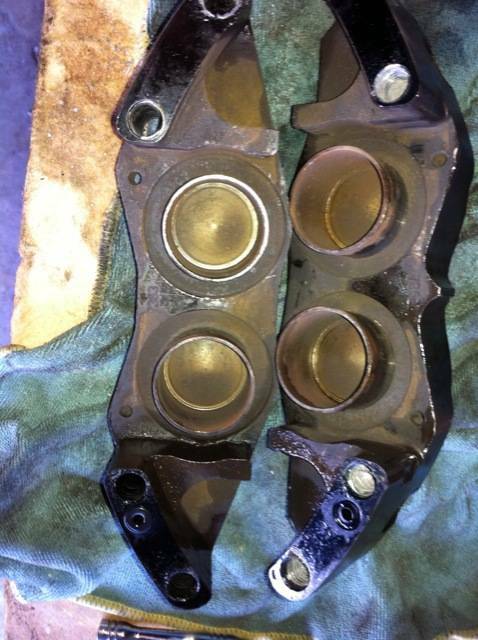 Remove the square-cut piston seals and discard 'em. Now I put a ton of Dawn dishwashing soap into a bucket and filled it with hot water. I got a couple of Scotch-brite pads and scrubbed the calipers inside and out, paying close attention to the holes that the pistons sit into. 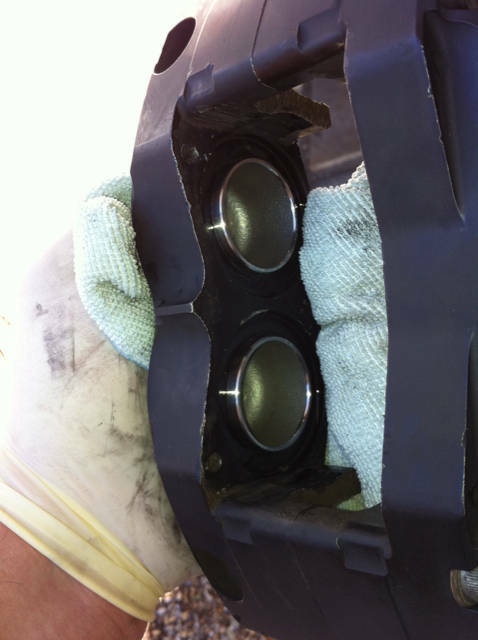 If you are reusing the pistons, scrub 'em until they are bright and clean. I then got out the dremel and a 1' felt wheel and polishing compound to give a bit of extra love to the holes that the pistons sit into. I'd polish up the pistons as well. 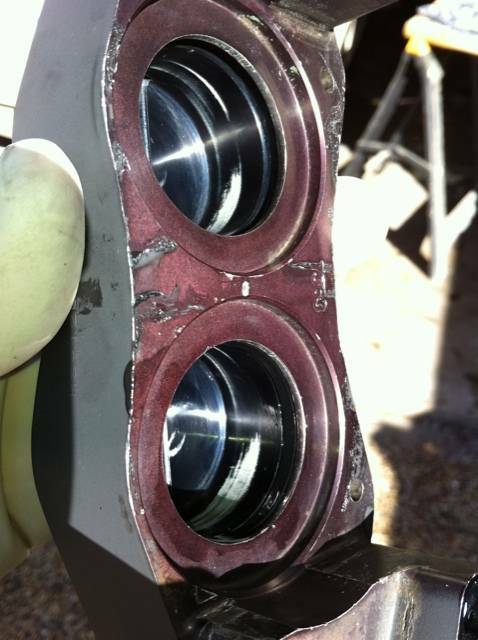 As you can see in the pics, the pistons were pretty cruddy. Everything got washed again after the polishing and rinsed in super hot water so that, after a towel off, the residual heat helped get everything nice and dry. I taped up the piston holes and masked off the surfaces where the two halves of the calipers join together. I also reinserted the old bleeder valves so paint wouldn't go in those holes and masked off the elbow on the back hald of the caliper. 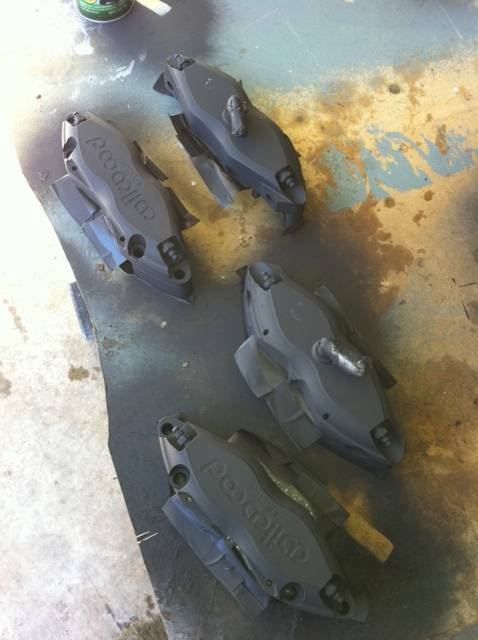 Everything got a nice coat of flat black BBQ grill spray paint. It's a nice stealth look, it's cheap and it is very easy to touch up... I find it much easier than most at-home caliper paint kits and it is VERY durable... they look great, even after a weekend at the track. I'm surprised I don't see it done more frequently. I stripped off all of the tape and got ready for assembly. 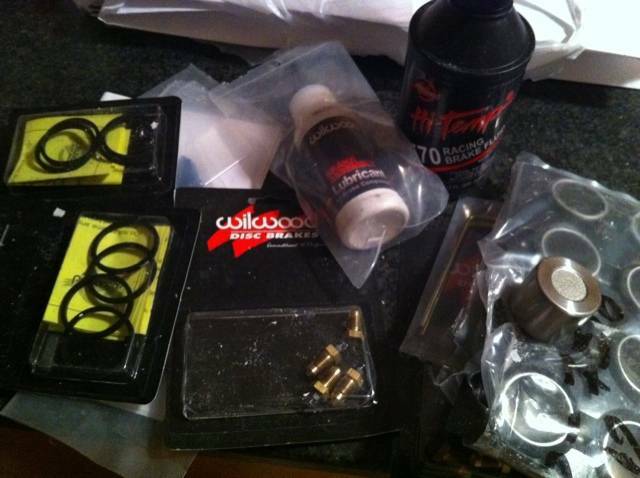 Step one was to get a paper plate out with a nice puddle of Wilwood assembly lube on it. All of the new square seals were coated with lube and slipped into their new slots. The new pistons got a coat of lube on the leading edge and they were twisted/fitted and pressed by hand fully into the calipers. I removed the old bleeder valves and put in the new ones. You have to pull the black stems out of the bleeder valves (on the front face of the caliper, at least) for clearance on the next step, reattaching the caliper halves and tightening the 4 bolts that hold the halves together. Reinsert the stems and make sure that everything is tight. Reattach the brake line and mount the caliper back on the hub. Now is a good time to make sure that everything is tight. 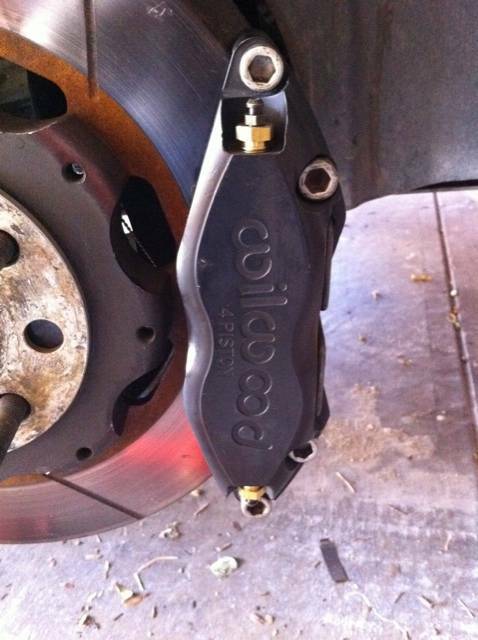 Slip on the new pad centering clips, re-install the brake pads and slide in the pad retainer. It will take a bit of time to bleed the new pistons as they have air trapped in them, but bleed them twice, both front and back sides of the calipers, from the top bleed valves. Clean everything well, dry everything thoroughly and climb in the car. Start the car and pump the brake pedal several times to make sure everything is firm. Press and hold the brake pedal for a minute to keep pressure on the system, then shut off the car and make sure that you don't have any leaks. 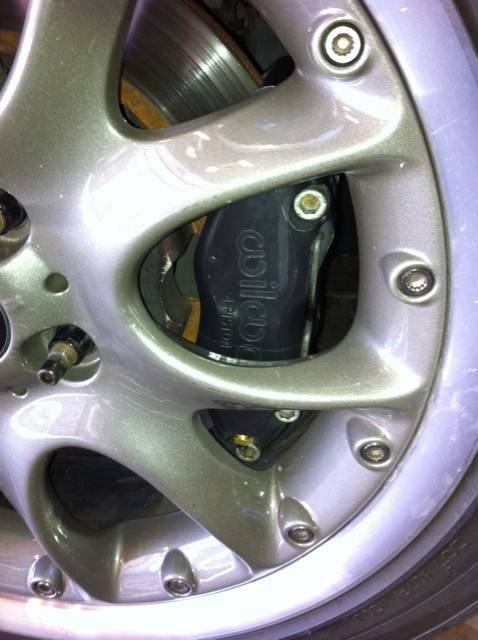 Once everything is safe and sound, put the wheels back on and lower the car. Torque your wheel bolts and go for a test drive, testing your brakes on a level sueface before you go down any steep inclines. total time: 3.5 hours of disassembly, scrubbing, polishing and painting + overnight dry time + 2.5 hours of reassembly, test driving, pick-up and clean-up. If you want the Euro rear lower fog light look, this article shows you how to create a lower fog light for your MINI Cooper.